“The said results, which are circulating in social media and local print media in Bohol, are fake. We enjoin media and the general public to validate with us any results purportedly conducted by Pulse Asia Reasearch, Inc.,” said Pulse Asia president Ronald D. Holmes. The polling body’s logo was featured on the upper right corner of the image which was spread over Facebook. The false survey was allegedly conducted from February 12 to February 17, 2019. Based on the result, gubernatorial candidate Leoncio Evasco, Jr. gained a commanding lead over rival Rep. Arthur Yap. The bogus survey claimed that Evasco garnered 56 percent of the votes while Yap only tallied 15 percent of the votes. 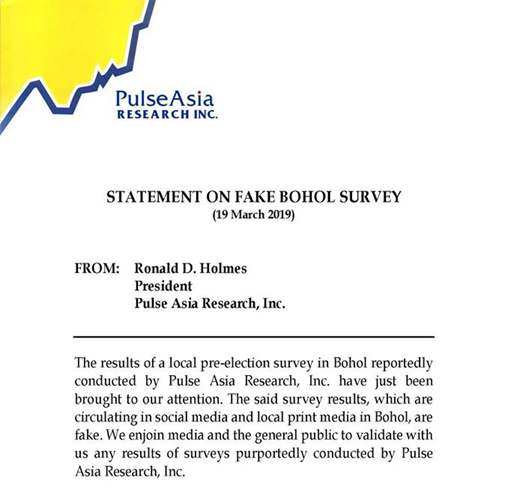 Dubious Facebook pages have also shared the fake survey result with some trying to peddle the false information through a newspaper page with a similar layout as the print edition of The Bohol Chronicle. 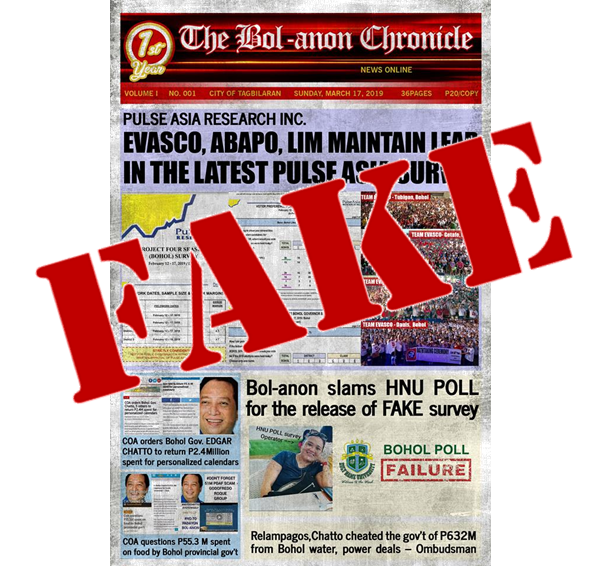 The widespread misinformation campaign was launched a day after results of a survey conducted by the Holy Name University-Center for Research and Publications (HNU-CRP), which covered pre-election polls on various posts and satisfaction ratings on officials and institutions, were released. The HNU-CRP Bohol Poll 2019 showed that Yap was to be elected governor by 53 percent of Boholanos if the gubernatorial election was held during the survey period, February 12 to March 6, 2019. Meanwhile, Evasco, perceived to be Yap’s top rival among three other gubernatorial bets, garnered 35 percent of the survey votes. The HNU-CRP has been conducting pre-election surveys in various national and local polls for several years now. In the 2016 national elections, the last presidential survey conducted by the HNU-CRP right before Election Day proved to be accurate. President Rodrigo Duterte and Vice President Leni Robredo, who both won in Bohol by wide margins, showed commanding leads over their rivals in the HNU Bohol Poll released on May 6, 2016, three days before the actual elections.